The disposal of portable and rechargeable batteries is regulated under EU and national laws. Since batteries contain heavy metals (e.g. lead, mercury and cadmium) that can cause serious environmental and health problems, they should be separately collected and recycled. 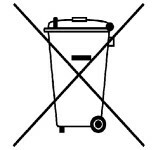 Batteries are labeled with the crossed-out wheeled bin symbol, which means that they must not be discarded as household waste. As a consumer, you have a legal duty to separate your used batteries from household waste and take them to a collection point for proper recycling. There are various battery collection points in your locality that will take back used batteries, including retail stores where batteries are sold and municipal waste collection sites. In some countries, collection bins and boxes are also set up in schools and other public buildings. The sales price of Nintendo battery-operated products includes the cost of battery collection and recycling. To find the nearest recycling centre, visit the Recycle More website and type in your postcode.